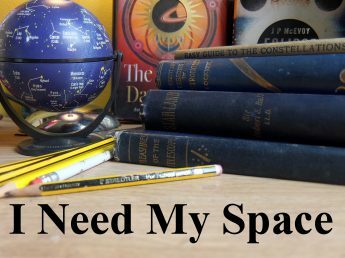 I Need my Space! | A personal astronomy weblog by Richard from Wolverhampton. Mostly thoughts, pictures and musings on practical astronomy and cool space stuff. While it’s all still in my head, a quick write-up of tonight’s observatory antics. Riiiight. M42 & 43, obviously. But also M78 through the 16″. A faint emission nebula, two stars ‘inside’. Great stuff. 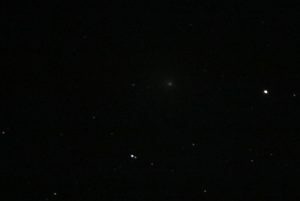 All through the 16″ mirror, the great open clusters of M35, M37 and M38. Steve, who turned up with his go-to, showed me the globular cluster M3 and I was all why haven’t I been looking at this more!. Through the 16″ it was stunningly bright. Superb! Found by ‘star hopping’ from Arcturus in Bootees. 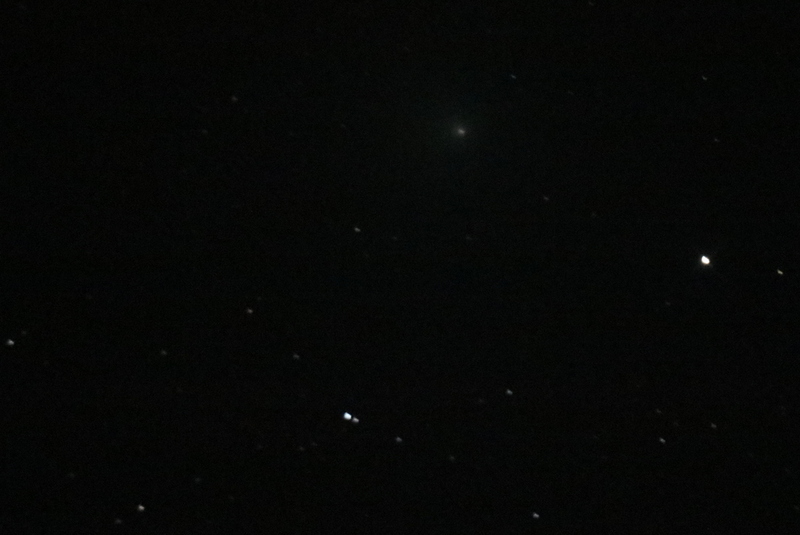 Over to the right, a smaller globular, M53, but still a very worthwhile sight. I found M3 in the dob also, by the way. So I get to say I properly found that. M1 (supernova remnant) in Taurus found, and it was surprisingly bright in the 16″. 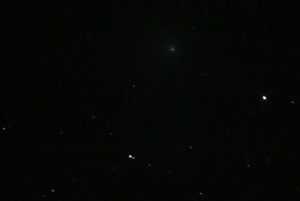 I looked at M40 below Sirius, (the ‘Little Beehive’) with the go-to. 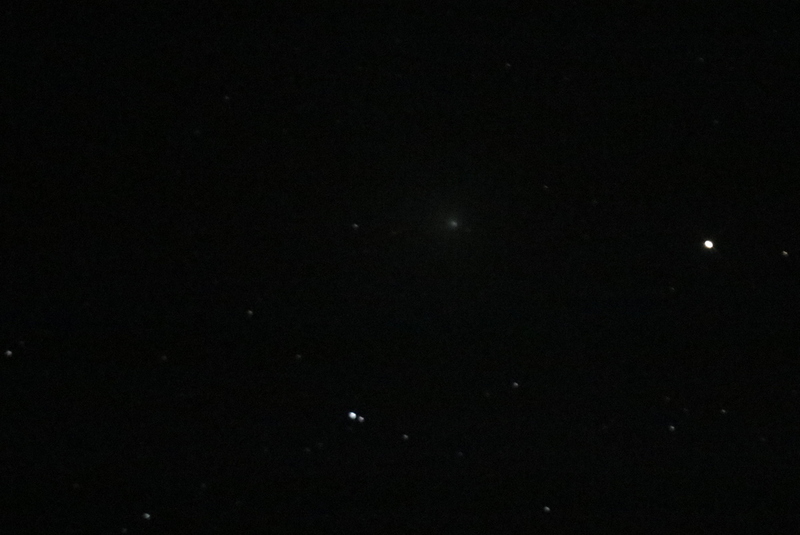 Leo was almost lost in the eastern Wolverhampton haze, but I still found the two elliptical galaxies, M65 and M66. Later, as it moved into darker skies toward the west, I tried to find more but the dew beat me. The double cluster was stunning through the 16″. I should write up the other stuff I’ve seen lately. I did an evening amongst Taurus’s open clusters at the observatory site with my 8″ reflector in mid Feb, and it was great fun. Chalk up NGC , 1647, NGC 1746, and the fantastic ‘Poor Man’s Double Cluster’, NGC 1817 and 1817. It really does look like a malnourished version of Perseus’ showpiece. The same evening I perambulated Canis Major, and more delightful NGC open clusters (2362, 2354), and the lovely Messier open clusters M46 and M47. Both distinctly different. The most detailed star map I’ve found on Cassiopeia is in the ‘on-line download’ section of the Sky at Night magazine, as part of their deep-sky tour series. I’ve printed and laminated their map of the western area, and I spend a couple of hours with the 16″ enjoying the open and often sparse clusters in the imagined triangle between the double cluster and the first two stars of the ‘W’. All clusters, and some of them a lot more ‘wow’ than M103, which makes me wonder what was going on with the M numbers, (in the same way the double cluster has no M number but the Pleiades do!). But you can’t argue with the M numbers. Especially if you’ve just bought a £28 book. Phew! I still need to write up the binocular and 4″ mirror observations I made in the Elan Valley in October. Hmm. The site’s domain is up in a few days, so it looks like I’ve either got to start putting stuff up here, or let it go. So I’m going to make a concentrated effort to update. I’ve done some smashing observations lately, through my own 8″ and the society’s 16″. But first, I’ll put up the current map-found and observed Messier list, (below). There’s still a good many to find. In fact, I’ve been to a new astronomy show today, in Kettering, and it was a smasher. Quite crowded, due I suppose to it being free, and only on for one day. I’ll put some photos up later. But check this out . . .
My lovely new Cambridge Press Messier Objects book. I bought a Cambridge Press Messier Objects book in the early 90’s, (there’s a picture on here somewhere), and it’s one of my favourite astro books ever. So this new volume, well, I just couldn’t resist. I’ve had my nose in it a few hours, and it’s encouraged me to re-double my hunt, and become much more methodical. And as for the blog, in the next few days I hope to put up some recent observations of open clusters in Taurus, Canis Major and Cassiopeia, and my Elan Valley dark sky photos from .. gulp! .. October last year. I also need to put up some news of the observatory. But first, the current Messier list. I really need to start taking my photography seriously now. The observatory is up and running, and there’s nothing to stop me from getting some guided mounts. Hell, I even know a guy that’s got some. I’ll see him tomorrow and try and arrange a meet up for a beer and a chat. I’ve got some very unimpressive photos of M42 and the Andromeda Galaxy, (below) and they’re as good as I’ll ever get unless I get the camera on a guided mount. It’s 2019 – the game’s afoot! I see spiral arms in my future! And star trails will be no more! A short piece I did for my local society’s newsletter. With the new society observatory still being finely tuned, (and hopefully open to members to visit in January 2019), we’ve temporarily installed my 8” Skywatcher Reflector in the dome, and it was through this that I tracked the comet in the early hours on Monday 17th December. I took some very basic shots, with my Canon 750 DSLR attached directly to the scope with a T-mount. The photos show the comet moving N N/W over a period of one hour twenty minutes. 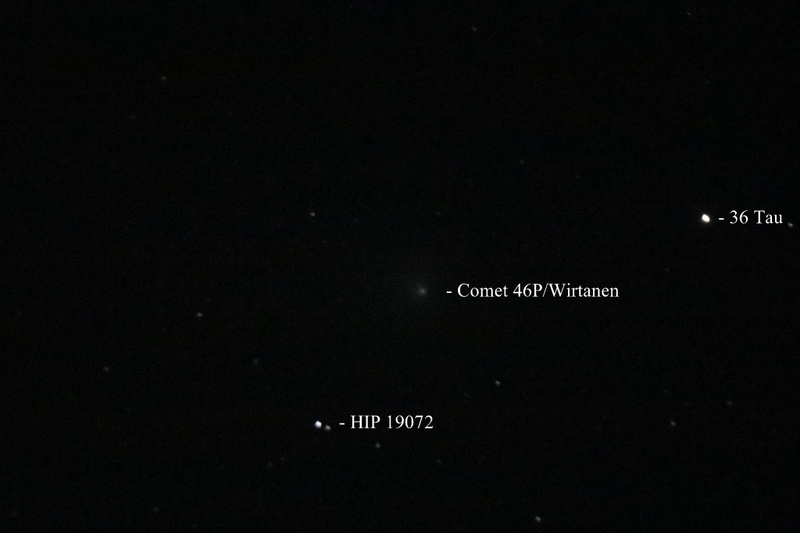 The comet was approx 11,580,000km away when I took these shots (only one second exposure time). When you spend an evening observing, very few telescopic objects change in real time. Jupiter’s moons can change, and very often you see one disappear, or reappear from behind the disc. I’ve also seen lunar shadows creep across flat areas near mountainous regions near the terminator of the moon, and there’s oculations and eclipses, but even so, it’s rare to see something move in real time, astronomically.So it was a real treat to map, watch and image the comet’s path among the stars of Taurus on that Monday morning. 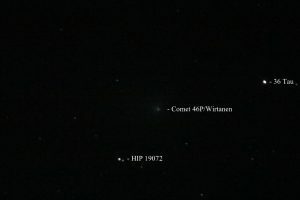 The comet will also be in the skies through January 2019. I’ve spent the last two nights over at the society’s new observatory. It’s not yet ready to be officially opened, but it’s getting there. Last night it was quite clear, and although there are issues with the scope, (which are hopefully solvable), it was good to see the sky clearing around 00.30 and the winter constellations rising. There’s a good chance it’ll be clear again tonight, so I may be writing up a binocular report soon. Anyway, I was at the observatory with another society member, and we were looking for Neptune. The Moon was right by it, and only a few days away from full, so the planet was lost to the Moon’s glare. But I do have some pictures taken with my DSLR from earlier in the week. I’ve been watching Neptune for the past three or four weeks. It’s heading ‘eastwards’. Neptune is mag 7.9 through November. I’m hoping to get more photos to show its movement. I did the same with Jupiter earlier in the year, but now I have a better lens to do it with, (a 50mm Canon EF, it says on the side). As I said, it was lost to the glare of the Moon last night, and in the city it’d almost certainly be lost to the streetlight haze. The photos above I took from the A41, about seven miles from the city. I haven’t bothered putting the small 4″ on Neptune. Uranus displays only a small disc through a much larger telescope, so I doubt I’d see a disc through the little Skywatcher. The society’s 16″ mirror, on the other hand, might well present us with a disc, as soon as the mirror is cleaned! One last shot of the Moon and Mars on the 18/10.2018. A very pretty sight indeed!